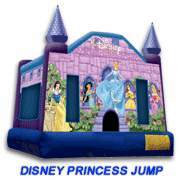 Jolly Jumpers moon bounce rentals serving South Jersey. The area's premier inflatable rental company specializing in backyard parties, school & church fairs, block parties, company picnics and any other event where fun is priority #1. 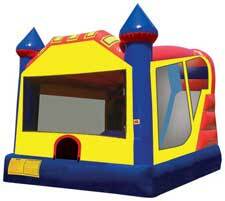 Moon Bounce Rentals and More! The Batman Challenge is an awesome centerpiece! Batman stands twice the height of mere mortals. The Challenge offers the players a front loading obstacle entrance with tunnels and pop-ups and objects to maneuver, leading to the main draw, the front-exiting climb and slide! BIG fun from a slide that is the perfect size for to fit most yards and the perfect price to fit your budget! 11FT tall x 22 FT long. Kids will ride all day long on one of the safest waterslides on the market. Can be used wet or dry to fit any party. Two rides for the price of one. 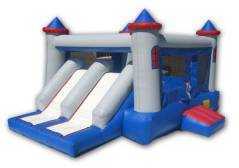 With the castle combo you get the best of both worlds, a huge jump zone and a slide. All this fun contained within one structure! OK, You asked for it. A Beautiful "Disney Licensed" Castle with life-size reproductions of all your favorite Disney Princesses: Cinderella, Snow White, Belle (Beauty & the Beast), Jasmine (Aladdin), and Sleeping Beauty. Bounce along with your favorite underwater friend --but don't forget to hold your breath. This jump is a great pick for all lovers of Sponge Bob and his zany antics. It's a favorite among the little ones. Dora Explorer: Travel with Dora, Boots, Backpack and the Map on an exciting outdoor adventure. Jump your way through their world on a fun-filled mission, but beware of Swiper! Bring the fun and physical challenge of an inflatable interactive unit right into the backyard. 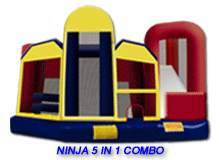 Nothing will thrill and entertain the little sports enthusiast more than Ninja Jump’s bright, happy Ninja 5-in-1 Combo! The perfect jumper for any Childs birthday party. 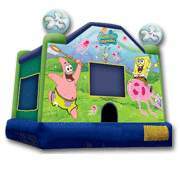 You can't go wrong with this high quality moon bounce! As the name states, this is the classic moon bounce loved by all. Perfect for any occasion. The kids will love this timeless classic. The best of both worlds, a dual lane slide & a huge moon bounce all rolled up in one. A real crowd pleaser for all occasions. Two pair of super huge bouncy boxing gloves in red and blue. 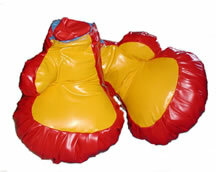 Combine these gloves with our classic bounce for a real bouncy boxing experience. Or, as an add-on for any of our bounces to make every party a real HIT! After the kids are tired of bouncing, the older crowd can stage the MAIN EVENT!